Last week, the Chicago Symphony Orchestra (CSO) assembled a promising program to celebrate the monumental music of Johannes Brahms. Anchored by two classics and spiced up with the U.S. premiere of a Brahms-inspired contemporary work, the program was poised to be a perfect marriage of the new and the old. 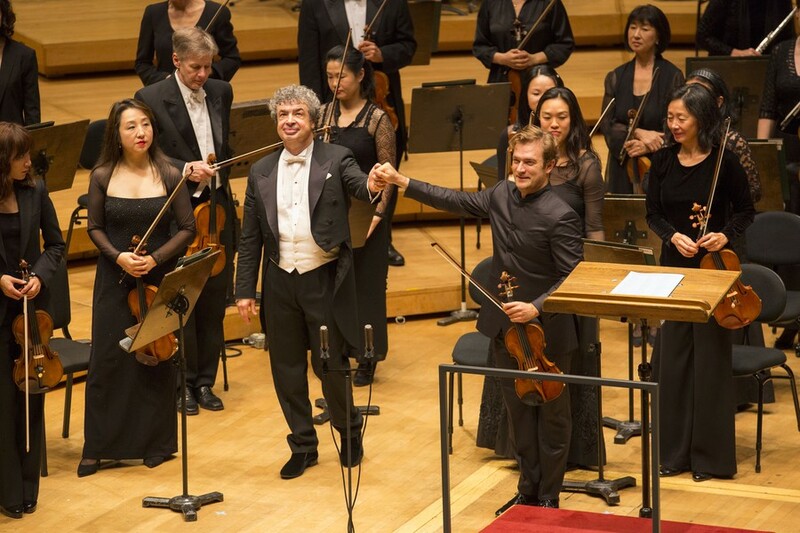 To top it off, Semyon Bychkov—a veteran Brahms interpreter—would be conducting. What wasn’t there to like? But something seemed to be in the air at Orchestra Hall on Thursday evening, during which an uninspired CSO only belatedly hit its groove. Even Bychkov, who usually strikes a marvelous pair with this—as evidenced by a two-week residency last season—couldn’t energize the program. German composer Detlev Glanert’s Brahms-Fantasie opened the program. Commissioned in 2012 by the BBC Scottish Symphony as a companion piece to Brahms’ Symphony No. 1, the Brahms-Fantasie isn’t quite what its title suggests. A fantasie implies virtuosic, solo improvisation upon a theme, but Glanert’s piece is something else entirely: a sparse, angular tip of the hat to a composer whose compositions are anything but. Snippets of Brahmsian motifs materialize from Glanert’s sonic cloud and then retreat, like a few pages from a Brahms symphony jumbled together in a blender and viewed through a glass prism. Glanert’s writing was decisive and razor-sharp, deserving of the attention Bychkov has showered on his compositions by championing them worldwide. Undoubtedly, his Fantasie would have been engaging had it been given a convincing performance. But disappointingly, the CSO sounded fuzzy and detached during Glanert’s 12-minute homage. One would expect the orchestra to perk up for the more familiar fare to follow—in this case Brahms’s epic Violin Concerto in D, performed by soloist Renaud Capuçon. And yet, the pall over the orchestra remained stubbornly cast. The first movement is opened by an extensive, slowly metamorphosing orchestral introduction, which, even without Capuçon to compete with, sounded as if it were held back. Capuçon’s robust, powerful tone added much-needed verve to the performance. His interpretation was very much in the lineage of virtuosos from days past, favoring a masculine, direct take on Brahms’ monologue for solo violin. However, though the fuoco and brio were present in spades, Capuçon’s performance rarely probed deeper than its virtuosity. Though a commanding performance on the whole, it seemed to pander more to the musical fireworks of the piece than its emotional content—a missed opportunity in a concerto like Brahms’. Ending the program was the Symphony No. 1 in C minor, Brahms’ belated first foray into the genre. (He completed the piece when he was in his 40s, by then an accomplished composer whose catalog included pieces for orchestra, but no symphonies.) Here, Bychkov’s interpretive prowess was apparent. Though his interpretation wasn’t novel on a grand scale, he honed in on the symphony’s gestural possibilities, lending some intrigue to Brahms’ warhorse. And yet, the CSO’s performance wasn’t quite consistent. Fortes and fortissimos were played stirringly while the rest of the piece’s dynamic architecture went unheeded; the orchestra’s focus picked up as the program went on but left the inwardly propulsive first movement out to dry. Luckily, good things came to those who waited: The two latter movements of the symphony were excellently sculpted and heroically played. At last, the CSO sounded its brilliant, golden best—but I don’t understand why I had to wait more than an hour for something that should have happened at downbeat. All in all, Thursday’s performance seemed to be one of those rare “off” nights. This program had the potential to perfectly embody CSO Zell Music Director Riccardo Muti’s vision for the CSO’s 125th season: a glimpse into the past that, in turn, informs the music of the future. Somehow, though, we ended up with a bland program all around: a timid offering from today and tired retellings from yesterday. Here’s to hoping the rest of the season will be better. This program runs again Tuesday, October 13th at 7:30 p.m., with a pre-concert talk at 6:30 p.m. in the Grainger Ballroom at Symphony Center. Student tickets are available for $15 at cso.org, or directly at the box office at 220 S. Michigan Ave.